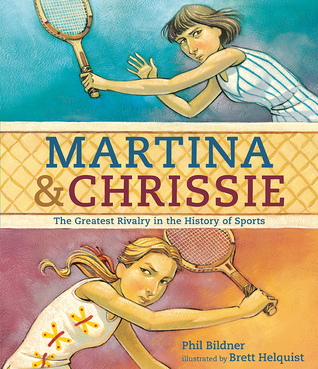 Phil Bildner writes about the rivalry between Martina Navratilova and Chris Evert with the enthusiasm of the sports lover that he is. This book reads in a conversational way that makes you feel like you're talking to your friends around the watercooler instead of reading a picture book biography. "...these two women formed the greatest rivalry in the history of sports. No, not the history of women's sports -- the history of ALL sports." I can't wait to share this book with students. I may even challenge them to create their own thesis to argue whether they agree with Phil's or not. I'm sure there will be many students in my neck of the woods who would say that Michigan/Ohio State football is the greatest rivalry in sports, but as long as they can back up their thesis, at least I got them fired up and ready to argue. So not only is this a great picture book biography that gets students talking, but it is one that a teacher can approach as a mentor text in a variety of ways. I love when picture books give me easily identifiable writing lessons.